Monday January 4th 1904 Still very cold. I was busy about the house all forenoon and began work on a dress I am fixing for Mother in the afternoon. 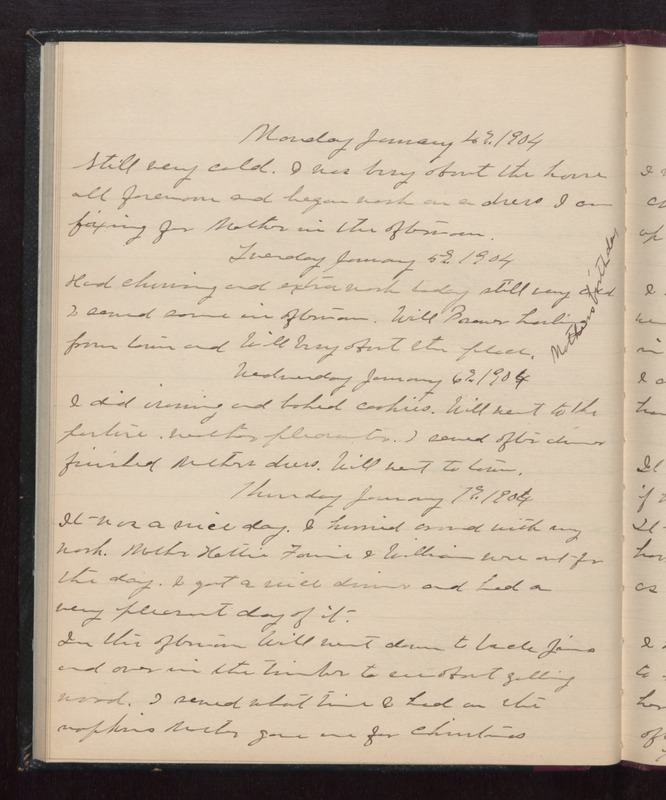 Tuesday January 5th 1904 Had churning and extra work today. Still very cold. I sewed some in afternoon. Will Brewer hauling from town and Will busy about the place. Mothers birthday. Wednesday January 6th 1904 I did ironing and baked cookies. Will went to the pasture. weather planter. sewed after dinner. finished Mothers dress. Will went to town. Thursday January 7th 1904 It was a nice day. I hurried around with my work. Mother, Hattie, Fannie & William were out for the day. I got a nice dinner and had a very pleasant day of it. In the afternoon Will went down to Uncle Jims and over in the timber to see about getting wood. I sewed what time I had on the napkins Mother gave me for christmas.